And Eli Monpress feels fine! On Monday, I gave you an interview with the excellent Rachel Aaron and now I am back to provide you with my VERY SPOILER-Y review of the final Eli Monpress novel, Spirit's End. Allow me to pause dramatically for a moment while I sob heartily onto my laptop keys. This was an incredibly awesome book and a fitting end to an impossibly amazing, engaging, well written and generally epic fantasy series. Every single character was wonderful, the world building was top notch and the story itself was too brilliant for words. If you couldn't already tell, I'm a giant fan of this series and the end was bittersweet. I desperately wanted to know what happened, but at the same time I wanted the book to last for days so I wouldn't have to say goodbye. I hate goodbyes. 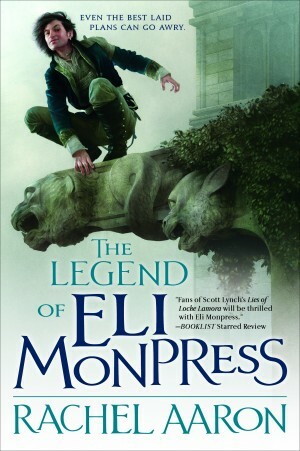 Thankfully, Aaron's goodbye to Eli Monpress was a fantastic romp full of the kind of charming antics I love, as well as many tense moments that knocked me sideways. Often my complaint with the end of a series are in regards to loose ends or unhappy endings. Thankfully this is not the case with Spirit's End. It is one of the VERY few fantasy series I've read that ended just perfectly. I am completely satisfied with it and I closed the book with a smile once I was done. I feel so hopeful about the future of Eli and his friends. Even if I am not there for the rest of their adventures, I just KNOW they're going to be epic and that they'll live well. I know Eli will increase his bounty and he'll be chased by Miranda and all will continue to be right with their world. Continue under the cut for my very spoiler-y review of Rachel Aaron's final Eli Monpress book, Spirit's End! First off, I'd like to steal a line from Doctor Who, specifically the ninth doctor. "Everybody lives! Just this once, everybody lives!". I was so worried something would happen to either Eli or Josef or Nico or Miranda... but everybody lives! I clutched the book to my chest with glee when I realized it, towards the end. It was touch and go there for awhile and I was getting prepared to lose Nico, but everyone pulled through in the end! That is one of my biggest fears when a series ends. People tend to die. Thankfully there was no "leaf on the wind" scenario here. Everyone takes a licking, but their hearts kept on ticking! 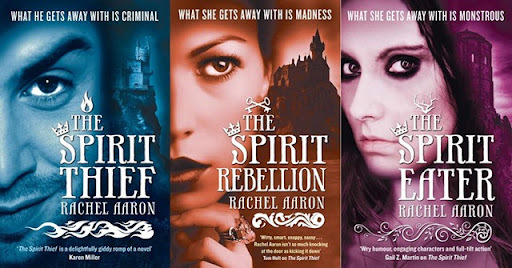 I want to congratulate Rachel Aaron on creating a completely engrossing series and populating it with amazing characters. I blame her fully for any nightmares I have that are caused by Benehime. Yes, Benehime, the psychotic Shepherdess is back in all her insane glory and something about her just sets my teeth on edge. She's so frightening. Benehime is completely out of her mind and wields unimaginable power. Not a good combination. She demands absolute respect, torturing you simply because she loves you. I don't know why that is so creepy to me, but it is. It's like Aaron dug around in my head for something that would so completely mess with me, then flung it at me like a booby-trapped Pokéball. "Rachel Aaron used Benehime! It's super effective!". Even just seeing her italics on a page made my skin crawl. Benehime is the least of Eli and co's problems, though. The entire world is starting to crumble around them as giant spirits, called stars, are violently yanked from the world. This throws the entire spirit world into chaos. Miranda has been named Rector of the Spirit Court while her mentor and leader is evading capture for treason and she takes it upon herself to try and solve this problem. This throws her back into the wake of Eli Monpress as he sails ahead trying to save his own skin. Throw in a little issue with the Lord of Storms and you have yourself a book full of calamities. The crux of the plot is as follows. Benehime has basically been catapulted off her rocker harder than a drunk girl off a mechanical bull in a cowboy bar. She's completely gone insane and is hellbent on destroying the world she was created to care for. She's handpicking the best great spirits and creating a tiny paradise for herself to escape into. All she needs is Eli to go with her, because he is her favorite and she loves him so much. Eli balks at this and refuses to aid her. Enraged, Benehime begins to bring about the end of the world. She goes to great lengths to tear it all down and it's finally revealed just how long a game she's been playing with everyone. Her brother Powers, the Hunter and the Weaver, also feature heavily into the plot. The Weaver is there to try and stop her and the Hunter... well, you have to read the book, my friends. I was in open mouthed shock when I read that part! Of course, the plot is much deeper and richer than that small description. I want you to go and read it! I won't spoil it all for you! Josef and Nico play an integral role as they band together to put an end to the chaos in the world. Josef, as always, gives 110% of himself as he hacks and slashes his way to savings his friends. Nico fights her own eternal battle as her demon nature threatens to take over. I won't tell you what happens, but it's an incredible chunk of character development. I am so impressed with Nico and how she's changed over the course of the series. She really surprised me. Eli is perhaps his most charming in this book. He's had to ratchet his cunning up to eleven just to be on the same playing field as some of the ancient, weary Powers that inhabit the book. He comes up with a world-saving plan in the nick of time and still manages to walk away from it all, grinning and thinking of ways to increase his bounty. He's shockingly reliable in his ability to outwit, outmaneuver and out bluff every other character there. He knows how high the stakes are and I was cheering for him when he finally tore off the shackles of Benehime. That took such strength and courage. I know he's a no good thief, but Eli is also incredibly noble and refuses to compromise what he believes in. We don't do starred reviews here at Stellar Four, but if we did, I'd give Spirit's End a twelve stars out of ten. A beautiful, hopeful end to a wonderful series featuring some of the most dynamic characters I've ever had the joy to be involved with. I love you, Eli! Good luck with your bounty! Josef, Nico, you watch him to make sure he doesn't do anything stupid. Miranda, you keep hounding him. I can't wait to re-read this whole series. This isn't "goodbye", it's "see you soon".